Discounted Rates for Lovely Hawaiian Princess Condo with Newly Remodeled Kitchen. GREATER DISCOUNT during the Summer of 2018 due to building repairs in process. Please contact for accurate rates; rates vary by season, # of guests, length of stay, etc. A White Sandy Beach is Below your large Lanai, while Eastward lie Mountains, Valleys and in Season, Waterfalls. Peacocks & Colorful Birds roam the valley. Makaha, a Well-Kept Secret, is a Resort Area on the Leeward side of Oahu, Where the Sun Shines Year-Round. The Hawaiian Princess is Just 45 Minutes from Bustling Honolulu, but a World Away from High Density Population. Here You Can Relax While Enjoying Natural Beauty and Peacefulness. 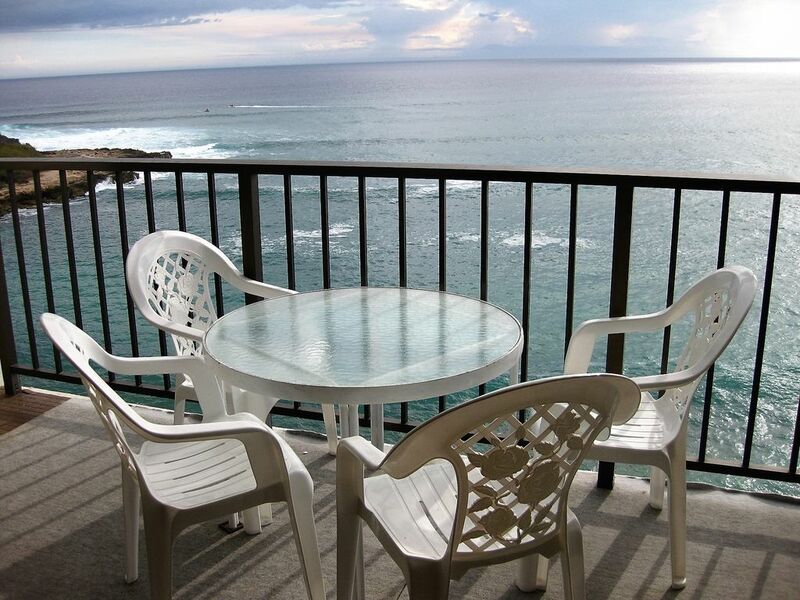 Watch the Sunset from Your 180 Degree Lanai Vista on the 8th Floor, or Sip a Drink on the Sand Below. See Whales, Dolphins and Sea Turtles go by. The Sound of the Waves Will Lull You While the Tropical Breezes Keep You Cool. This Fully-Equipped Condo Has it All (linens, kitchenware, beach equipment, washer and dryer, etc.). The condo features two cable TVs, DVD/Blu-ray player, WI-FI, air conditioning (although you won't need it with our wonderful tradewinds), very comfortable queen-sized bedroom and a queen sofabed in living room. There's also a floor futon if the 3rd & 4th guest do not choose to share the sofabed. All beach equipment is provided (chairs, umbrella, mat, cooler, boogie boards, and snorkeling gear). Parking is free and secure in private parking lot. Golf Enthusiasts, Minutes Away Play at the Makaha Golf Club, a Championship Course Acclaimed for its Beauty as Much as its Rigor by Golf Digest. Another Nearby 18-Hole Course is the Makaha Country Club. Just ask owner about availability and rates. Owner who takes pride in home-ownership, continually making enhancements to the home so all visitors enjoy their stay and want to return. The beachfront and spectacular sunset views from the lanai. The natural beauty and peacefulness of the local area. Relaxing and swimming on the beautiful beach just below the well-cared for and secured Hawaiian Princess building. Dining on the lanai while watching the sunset. Lounging by the pool or in the jacuzzi. Barbequeing by the beach at the BBQ area. 180-degree beachfront vista from the private lanai. Parking is free. Please post parking pass on dashboard. Beach towels provided as well as bath towels. Sofa, coffee table, dining table, wall-mounted TV and cabinet with DVD and wireless router. 42' wall-mounted flat-panel HDTV with DVD, in living room. 32' flat-panel TV in bedroom. Blu-ray player can play both blu-ray disks and DVDs. Various books available in the condo and in the downstairs lobby's sitting area. Ping Pong table in the rec room near the pool. Cards, puzzles and games in the condo in the cabinet under the counter by bar stools. Various children beach toys are in the lanai closet. Great Rental in Makaha, Oahu! We stayed in this condo for the month of February, 2018. It fully met our expectations and is a great choice if you're looking to stay in a rural area of Oahu. The Hawaiian Princess is ideally located right on the beach and the staff there were very friendly and accommodating. The pictures of this condo are very accurate. Monica was excellent to deal with and very prompt in her responses including the return of damage deposit. We wouldn't hesitate to rent this condo again in the future! Thank you dear guests for your great review. I'm so glad your stay fully met your expectations and I really appreciate your positive feedback. I look forward to the next time you decide to choose my Hawaiian Princess condo for your Hawaiian vacation. Mahalo and Aloha! Views from inside the condo and the lanai are breath taking. We saw whales every day, and large sea turtles. The sunsets are amazing. Views of the Makaha Valley out the back are fantastic, as well. The large sandy beach is right off the lobby, and unlike other beaches in Oahu, not crowded. This condo is an ideal choice for those looking to escape the tourist crowds and pace in Honolulu, yet it is close enough to drive to any part of the island. We recommend having access to a car for stays longer than a week. The listing was accurate and Monica provided additional helpful hints prior to our arrival. The condo was very clean upon arrival and had many extras not normally found in VRBO rentals. Monica was readily available to respond to queries. There is a beautiful golf course only five minutes away, tennis, pickle ball, pool/hot tub, snorkelling and, of course, sun bathing on the beach. We had a wonderful time and plan to return next year. We definitely recommend staying in Monica's condo on the beach! Lovely unit right on the beach! This is a lovely unit, very well kept and the views from the lanai are absolutely beautiful. You can hear the waves on the beach, and view the sea life. We saw turtles, a seal and could hear the whales at night. The condo has everything you would need, and more! There are beach items in the closet for use by guests, and it is a very easy commute from Honolulu, or to the highways that take you to the North Shore or other areas on O'ahu. Thank you, Monica for a truly relaxing stay! We were looking to stay away from Waikiki and the hustle/bustle , but still not too far from Pearl Harbor . Luckily I picked the right location . The scenery was delightful , it was quiet , safe , clean , and very comfortable . The owner was very easy to communicate with and refunded my security deposit promptly . All that I regret is not having another week to spend at the Hawaiian Princess . This was my fifth trip to Oahu and the Hawaiian Princess. I wouldn't stay anywhere else on the island! Papaoheone Beach is spectacular! Every unit faces the ocean, and the half a mile of beach is never crowded. It is so easy to access the beach. Monica's unit was well stocked with beach equipment, and the kitchen is newly remodeled and has all of your cooking needs. I also like observing life in Makaha and Waianae apart from the superficially of Waikiki. We ate at Crab Shack twice, and it was a joy to observe local families enjoying fresh seafood. It's the real, every day Hawaii! Oh, and the sunsets at the Princess are awe inspiring! I loved this condo. The location was excellent. The beach is right outside the Lanai. The view is the best I have ever seen. It is located on a main road and makes locating local activities easy. It is quiet and well maintained. I give this condo 4 stars. Would definitely stay there again. The condo is approximately 11 miles from the new Aulani Disney Resort & Spa (it's a direct route on HI-93 E/ Farrington Hwy). Marriott Resort and Spa at Ko Olina. Snorkling equipment provided (in Lanai closet). Water Theme Park 15 minutes away.